Email is one of the oldest technologies introduced on the Internet and is still fully integrated within the web even with the introduction of social media networks. Email is still a favourite among consumers. People still prefer email for commercial communication. Emails are sent when creating new accounts, for promotions, order confirmations, shipping notifications, upcoming events, reminders and so much more. 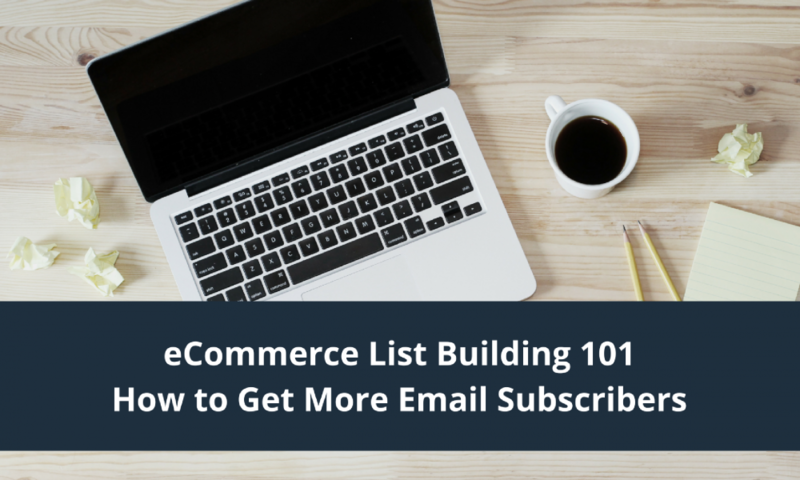 I’ve written 6 blog posts to help you get started with building your email list for your eCommerce business. Enjoy! The key to getting more email subscribers for your eCommerce newsletter is to avoid making the 3 common mistakes I see online stores constantly make when it comes to list building. Before I share those mistakes, let’s get something straight. If you’re struggling with convincing website visitors to signup to your list, it doesn’t mean that email is dead. Email is far from being dead. If you’re like most online retailers, you spend a lot of time and effort building your email campaigns. I hope you are because email works! Your success in email marketing will depend a lot on the size and quality of your subscribers list. One of the keys to more email subscribers is to give shoppers an opt-in promotional coupon offer they simply can’t refuse. What if I told you there’s a simple way to get more email subscribers for your newsletter? If you’re like most online store owners or digital marketers, you’re already spending money driving traffic to your website from search engines, social media or physical stores. Why not leverage this traffic to help grow your email list since email marketing still remains as one of the best digital marketing channels for eCommerce businesses? Let’s get something out of the way. People don’t hate ALL types of popups. They hate the ones that show up at the wrong time with the wrong offer. When used properly, opt-in popups will help you acquire lots of email subscribers for your eCommerce newsletter. When it comes to email marketing, there is one thing that is far more important than anything else. That thing is your email list. Quality over quantity is still important. A small list of interested people who engage with your brand is much more valuable than a list of 100,000 people who are all likely to hit the delete or unsubscribe buttons when your email arrives in their inbox. Are website popups annoying? Most people say yes. I personally love popups…only when they’re done done right. What do I mean by done right? A popup that targets the right audience, at the right time with the right offer, is a popup that is done right. It will deliver positive results. Even if you hate them, opt-in popups do work and you should consider using them for your online store so you can acquire new subscribers.